Manufacturers have relied on various process control methods and applications for well more than 100 years, the primary objective being to increase the plant’s throughput, its production, and safety. 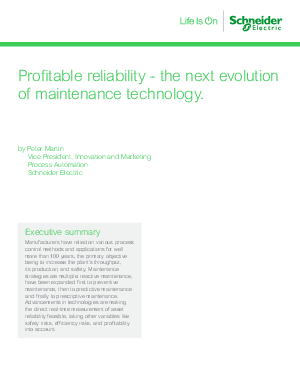 Maintenance strategies are multiple: reactive maintenance has been expanded first to preventive maintenance, then to predictive maintenance and finally to prescriptive maintenance. Advancements in technologies are making the direct real-time measurement of asset reliability feasible, taking other variables like safety risks, efficiency risks, and profitability into account. The ultimate objective of any industrial enterprise—from plant operations to maintenance—is to maximize and control operational profitability, and safety in real time. This is becoming even more critically important because the speed of industrial business continues to increase. For example, only a decade ago many industrial plants had contracts with their electricity suppliers that designated the price they paid for a unit of electricity for an entire year. Today on the open U.S. power grid, the price of electricity can change every 15 minutes. Trying to manage the business of industrial operations with monthly data from ERP reports is no longer feasible; you need to control it. This starts with controlling operational profitability in real time, which is directly linked to controlling and measuring the reliability of the plant’s assets and asset sets right down to the equipment level. But to get to that point, we have to start from the beginning.